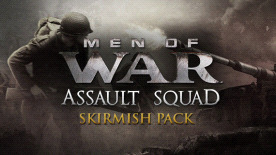 Objectives of the missions are very different to the existing ones in Men of War: Assault Squad and provide a completely new challenge as your task is to defend four strategic positions against waves of enemy troops to hold out long enough to launch a counter attack and finally defeat the enemy. Skirmishes are created for enormous replay ability, as the launched attack by the enemy will vary every time the player picks the mission, additionally the complexity of the mission increases with choosing a different difficulty, since the AI will use new type of units to heat up the battle. Those missions can be played up to 8 players cooperatively online or in single play.